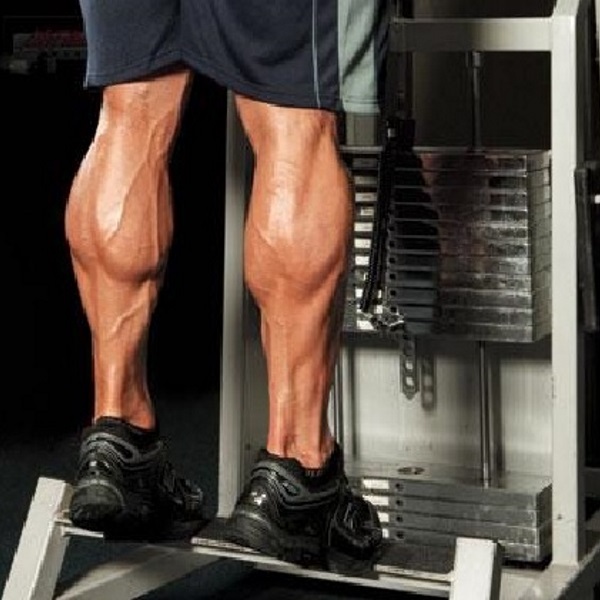 Calves don’t get much love from bodybuilders out there. Most guys don’t even bother to train them in fact. While hamstrings and quads certainly do the most in terms of supporting your body while lifting heavy weights and they definitely look more impressive, calves still play a role in stabilizing the body through a lot of these movements. If your calves are weak and unable to support your body you put yourself at serious risk of injury. Also, if you train the rest of your body and not the calves you will end up with an unbalanced physique or chicken legs. While squats and deadlifts certainly give your calves some work it’s recommended that you also give them some direct work. There are two muscles that make up the calf. The first is the gastrocnemius – this is the part that is visible when you look at the calves from behind. The other is the soleus, which is a deeper muscle that cannot be seen externally. Their function is to lift the heel in the air when you go up on your toes or when you lift your knee in the air. You can perform this exercise with a calf raise machine or on the edge of a step. The reps and weight depend on your training level but try out different rep/weight schemes to figure out what works best for you. Remember to start with your heels at a deficit and raise yourself slowly, holding form at the top. If you rush these you won’t get the full benefit. Also make sure you don’t bend the knees too much and transfer some of the weight onto your quads or hamstrings. While some people think this is no different than the standing calf raise it actually targets the lower part of the calf (soleus) a little bit more. Again you will want to start at a deficit and slowly lift the weight to the top, holding at the peak and contracting. Rep range should be between 10 and 20 but try not to use too much momentum to move the weight – keep the pressure on the calves. Also known as the donkey raise, this one is a bodybuilding classic. This exercise actually allows for a deeper pull in the calves and actually looks pretty cool. Sit on a leg press machine but instead of pressing the weight you will use the top of your feet to move the weight. Keep your knees and hips out of the exercise and put the movement into your ankles – it’s the only place you should feel the exercise.